This huge tom turkey will look great on your Thanksgiving table or place this gobbler by your front door with a candle under him to greet your holiday guests. He's not to scary even with an armful of little monsters. 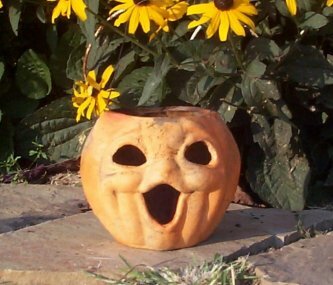 His jack-o-lantern has eyes cut out to luminate a lite or candle under him. This small pumpkin house with cutout windows and door will greet your little fairies when they visit your garden. This large caldron has stars cut out so you can place a candle in it. This cut-out witchie girl is not scary when you place a candle under her. Skull has cut out face with a black raven sitting on his head. This spooky house has cut out windows and a jack-o-lantern face. Place a candle or lights under and watch it glow! This large witch leans over her black cauldron. The cauldron has stars cut out so a candle can shine through. Witch also has a space in her hand for a sprig of anything. This creepy witch hand will look very spooky holding a white skull candle cup (sold separately) or any kind of votive in the palm of her hand. Hand measures approximately 8" tall. This small skull cup will look gorishly good in the palm of one of our Wicked Witch Hands (sold separately). This vintage style witch has carved a face in her pumpkin...what a fright! 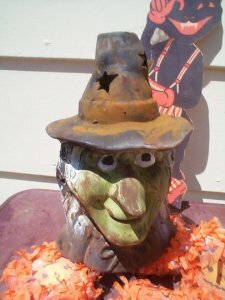 Witch measures approximately 10" tall. This vintage style witch's hat candle cover will look great on your outdoor picnic table with a t-lite size candle inside. 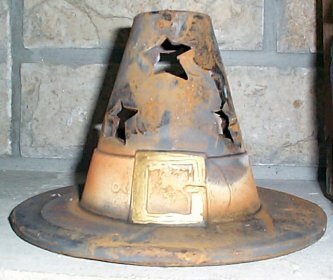 Hat is made of ceramic and kiln fired at extremely high temperatures so that it will withstand the outdoor as well as the indoor weather. 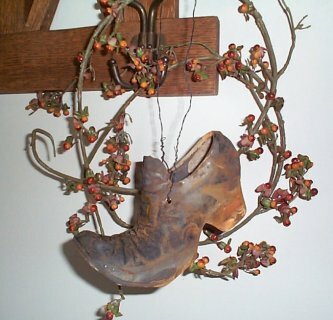 Hang this shoe on your Halloween tree or place a bittersweet vine in it and use on your table. Witch shoe is made of ceramic and kiln fired at extremely high temperatures so that it will withstand the outdoor as well as the indoor weather. Our witch head will candlelite your porch steps this Halloween night as the glow luminates through the cut out stars. Witch head is made of ceramic and kiln fired at extremely high temperatures so that it will withstand the outdoor as well as the indoor weather. Replicated from a vintage paper mache, this candle holder will look great on your dinner table or hanging outside with a votive size candle inside. 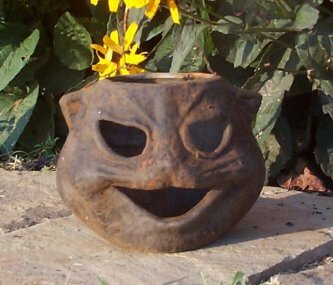 Cat is made of ceramic and kiln fired at extremely high temperatures so that it will withstand the outdoor as well as the indoor weather. 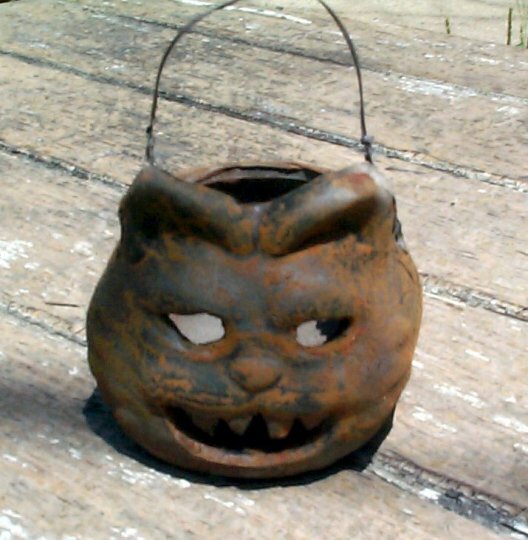 Trick or treaters will be welcomed at your door when greeted by this reproduction of an antique paper mache Jack-O-Lantern. 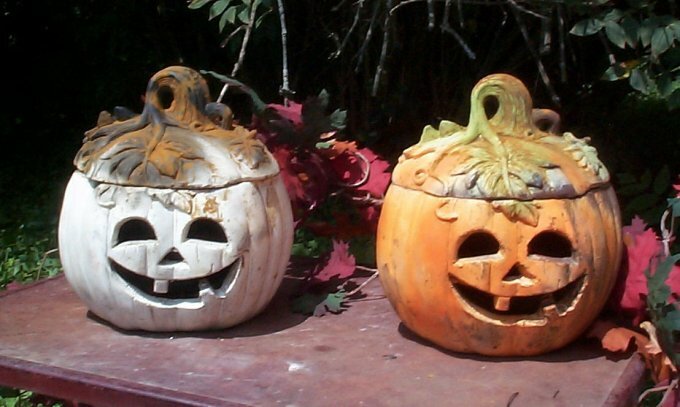 Jack-O-Lantern is made of ceramic and kiln fired at extremely high temperatures so that it will withstand the outdoor as well as the indoor weather. Our witch shoe will candlelite your porch steps this Halloween night as the glow luminates through the cut out stars. 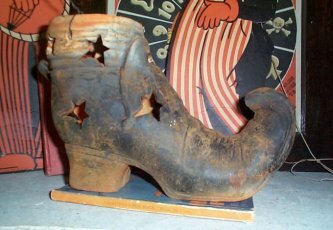 Witch shoe is made of ceramic and kiln fired at extremely high temperatures so that it will withstand the outdoor as well as the indoor weather. Place a candle under this candle cover to light your Halloween night! Pumpkin is made of ceramic and kiln fired at extremely high temperatures so that it will withstand the outdoor as well as the indoor weather. 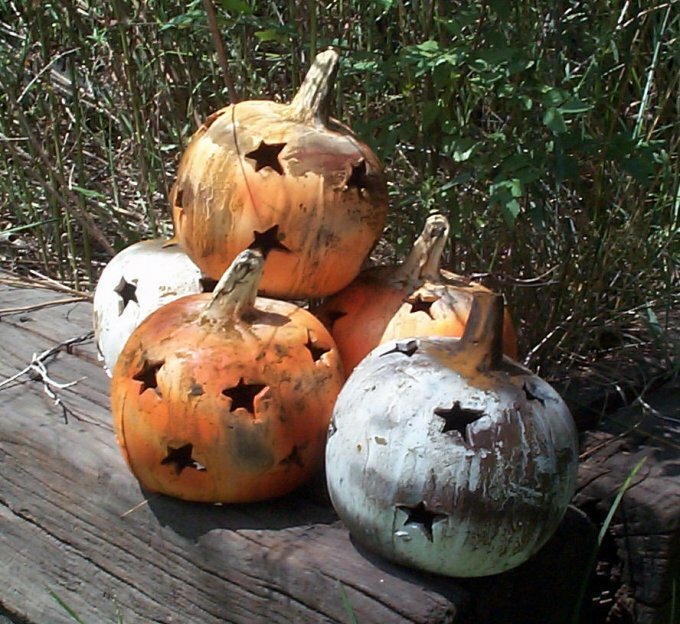 Place a candle in this pumpkin and have a jolly Halloween 'cause it's the happiest we've ever seen. Trick and treaters who come to your home, will have no fear when ghosts and goblins roam. You can also turn this pumpkin around to leave out all Fall. Pumpkin is made of ceramic and kiln fired at extremely high temperatures so that it will withstand the outdoor as well as the indoor weather. Mix this black cat with our Mini Jack-O-Lantern Cup Ornaments to create a Halloween tree to Die for! Black Cat Ornament is made of ceramic and kiln fired at extremely high temperatures so that it will withstand the outdoor as well as the indoor weather. Our black cat lantern, reproduced from a vintage paper mache, is sure to bring good luck when you place a candle in it this Halloween. 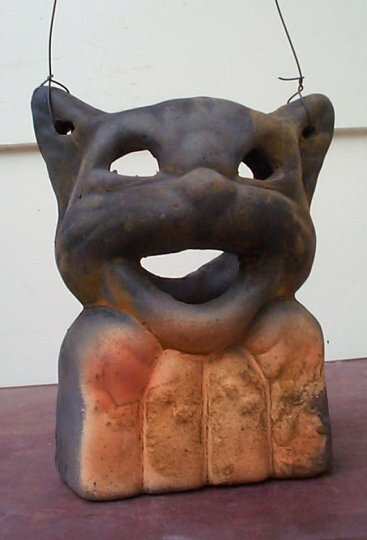 Black Cat is made of ceramic and kiln fired at extremely high temperatures so that it will withstand the outdoor as well as the indoor weather.